Canada's health ministry on Thursday approved a type of genetically modified salmon as safe to eat, making it the first transgenic animal destined for Canadian dinner tables. This comes six months after US authorities gave the green light to sell the fish in American grocery stores. 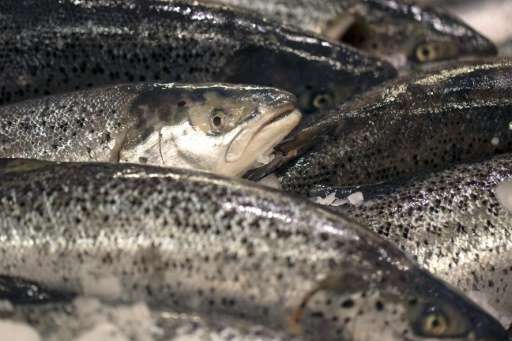 The decisions by Health Canada and the US Food and Drug Administration follow two decades of controversy over the fish, which is an Atlantic salmon injected with genes from Pacific Chinook salmon and a fish known as the ocean pout to make it grow faster. The resulting fish, called AquAdvantage Salmon, is made by AquaBounty Technologies in Massachusetts, and can reach adult size in 16 to 18 months instead of 30 months for normal Atlantic salmon. The company is raising them in contained, land-based hatcheries in Canada. Health Canada said in a statement that testing over the past three years found the altered salmon "to be as safe and nutritious as conventional salmon." Consumer groups, however, raised concerns that it could be dangerous to human health and may pose risks to other fish if it were to escape into the environment. They also criticized a lack of labeling. "We find it deplorable that the (Canadian) population is now faced with the commercialization of the first GM animal in the world, approved in Canada without consultation and without independent studies," said Thibault Rehn of Vigilance OGM. He cited an Ipsos Reid poll commissioned by the group last year that found 45 percent of Canadians would not want to eat genetically modified fish, and 88 percent supported mandatory labeling. Health Canada only requires labeling for genetically modified foods if there is a proven health risk, such as an allergen in it, or its nutritional value has been significantly changed. "GM salmon production threatens the future of wild Atlantic salmon," said Calinda Brown of the Ecology Action Centre. "Retailers can protect consumers and the environment by making sure this GM fish never makes it to grocery store shelves," she said. The FDA in November, however, noted that the fish are "reproductively sterile" and so would be unable, if they escaped from hatcheries, to breed with others or establish populations in the wild.